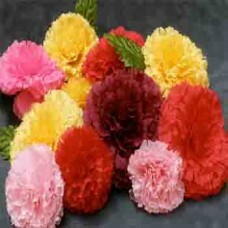 Bright, long lasting, sweetly fragrant Carnations are a fantastic way to say Happy Birthday! We've taken a traditional favorite and updated them in bold new colors that will make the day even more festive. To allow these beautiful flowers to last much longer, they are shipped fresh, budding, and ready to bloom. 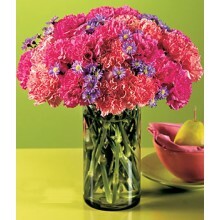 (Vase design may vary) Contains two dozen brightly colored pink and orange carnations, accented with asters. Your purchase includes a complimentary personalized gift message. 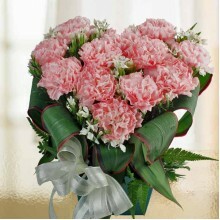 10 Pink Carnations Heart-Shape Table Arrangement in Plastic Container. Your purchase includes a complimentary personalized gift message. 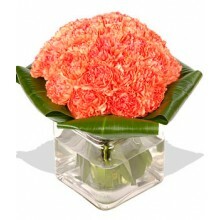 20 orange carnations with green leaves arrange in cube base. Your purchase includes a complimentary personalized gift message. 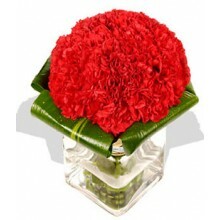 20 red carnations with green leaves arrange in cube base. Your purchase includes a complimentary personalized gift message. Tap into their sense of style with our magnificent mug of blooms! 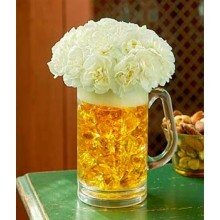 This fresh addition to our Happy Hour Bouquet series is crafted from the freshest white mini carnations in an acrylic beer mug, with special acrylic rocks to symbolize their favorite brew. Toast any occasion, from birthdays to Father’s Day, with this amazing arrangement! Our florists select the freshest flowers available so colors and varieties may vary *This product is available only within Metro Manila Deliver. Your purchase includes a complimentary personalized gift message. 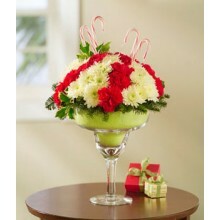 Toast a happy and healthy day with this fun and festive collection of fresh 20 carnations, mini carnations, poms/mums, greenaries and candy canes or straw brimming from an oversized margarita glass! A special edition from our Fresh Flower Happy Hour series, this gift puts a sensational twist on sending your best wishes. 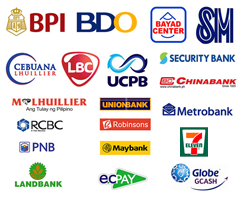 Note: This product is available only within Metro Manila. Your purchase includes a complimentary personalized gift message. 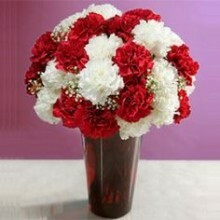 Mixed 10 White & 10 Red Carnations in a Vase. Note: Vase design may vary. Your purchase includes a complimentary personalized gift message.